Please don't call them cupcakes! 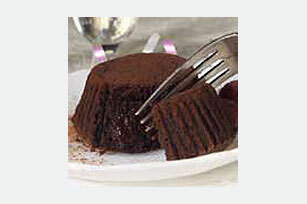 Served warm with a slightly soft center, these Petite Mocha Cakes prefer to be known as elegant desserts. Preheat oven to 400°F. Microwave butter, chocolate and coffee in large microwaveable bowl on HIGH 1 min. or until butter is melted. Stir until chocolate is completely melted. Freeze 5 min. or until cooled, stirring occasionally. Beat eggs, powdered sugar and vanilla in large bowl with electric mixer on high speed 2 to 3 min. or until well blended. Add chocolate mixture; mix well. Combine flour and cinnamon. Add to chocolate mixture; beat just until blended. Spoon evenly into 12 paper-lined medium muffin cups. Bake 8 to 10 min. or until cakes are slightly puffed and feel firm at edges and soft in center when pressed with fingertip. Cool 5 min. ; remove paper liners. Serve warm. With their built-in portion control, these cakes make a great treat. Garnish with a light sprinkling of additional ground cinnamon and fresh raspberries just before serving.